The Dr. Comfort Lana sandal is both comfortable and functional. 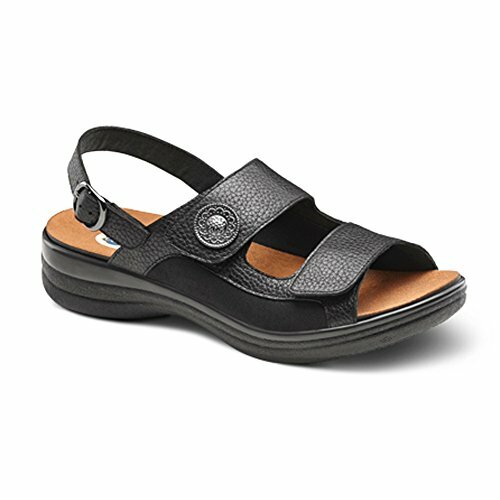 With stretchable lycra sides, the sandal helps accommodate bunions and other foot deformities. Features include a stylish button accent, a removable footbed for custom orthotics, velcro closures over the forefoot and a buckled closure on the heel. Available in Brown and Black. Exotic textures and classically appointed jewel accessories highlight the womens styles. For the men, a removable back strap to convert to a slide. All styles have removable footbeds for custom orthotics. Smooth leather with double Velcro closure.